South Korea may be one of the best places to live, being one of the most developed countries in the world, one of the world’s fastest growing economies from 1970s to 1990s, one of the most equilibrated income of the world. South Korea overtook Japan in some ways. I love South Korea more than Japan mostly because of architecture and apartment complexes, the Japanese cities having too many landed houses. Despite of capitalist government, South Korea share many similarities with the communist North Korea, for example economic isolation and little free trade with rest of world. They use mostly locally-made products and foreign companies hardly get market share there. You rarely see foreign cars driving around. Less than 2% use Google, they use locally-developed search engines Daum.net and Naver.com instead. Another similarity with communism is the massiveness of apartment blocks, private developers built distinct complexes but with identical buildings arranged in grid all around the city. South Korean society emphasizes the family, not the community, and the apartment design reflect that. Korean developers pay attention to offering best living conditions instead of maximizing their own profits. Apartment blocks are usually 15 to 30 floors and large open spaces between them, not crowded by developers hungry for profit like in other countries. All units come with floor heating and high-tech fittings (details below). People hate the appearance of the apartment complex, but love to live in an apartment unit in that complex. South Korea have the world’s highest broadband internet access per capita and fastest internet speed according Wikipedia and nuallure.com/state-of-the-internet. I also love extensive Seoul Metro system which extends to outside of Seoul city limits (10 million people) or metropolitan area (24 million people), 331.5 km of lines built for metro, plus the Korail lines used by metro trains, totalize 1108 km of metro network, longest in the world. Then high-speed KTX trains opened in 2004 that runs at speed up to 300 km/h, going from Seoul to Busan in 2 hours. Incheon International Airport won the best airport award in 2009 and 2012. Plenty of information about South Korea housing is available on internet, but in Korean language. map.naver.com is the first map service in the world that include not just apartment block numbers but also number of floors and apartment size in square meters. You can click on estate name to see number of apartments, year built, transactions with price, and floor plans. Note: floor areas shown on map are in 95% cases gross floor area and in 5% cases net floor area, check estate pages to make sure what it i. Naver also have own streetview with better coverage than Google Street View. Does anyone know when it was launched? I found it in 2018, last time I checked Naver was in 2013 and it wasn’t available. I can theoretically make a detailed research-database that calculate number of blocks, units, average unit size, etc, for each apartment complex, similar with HDB database that I made for Singapore, but I will not do this unless there is potential of making money. namu.moe is a Korean site similar with Wikipedia having a directory of apartment complexes, including their history, facts and figures such as apartment size. Older method to find floor plans: use wikimapia.org, get apartment complex name in Korean and put it in Google Image Search, for example Apgujeong Hyundai Apartment = 압구정동 현대 아파트. blog.naver.com contains numerous articles with floor plans, searchable by complex name. If Wikimapia shows name in English, use Google Translate. Do not make searches in English because you will not find much info. As 2010, 25,008,212 people live in high-rise apartments; 15,941,063 in houses; and 4,974,719 in villas, or smaller apartment buildings (source). South Korean high-rise apartments are one of the biggest in the world, their size vary from 40 sqm with 1 bedroom to over 300 sqm with 6 bedrooms, majority being in 80-200 sqm range (gross floor area) of which 20-30% are balconies. Seoul have more apartments of larger types than national average. I noticed a trend of downsizing along recent developments (2010s) compared with those built in 1990s and 2000s. According forums.eslcafe.com (post from 2003): The average size of an apartment unit in Korea was measured at 31.8 pyeong (104.9 sqm), nearly 6 pyeong larger than the 25.9 pyeong average from 13 years ago, a survey showed yesterday. The average size of apartment units in Seoul came to 34.5 pyeong, larger than the nation’s average by 2.7 pyeong. 11.6 percent of the surveyed apartment units measured less than 20-pyeong, while 37.1 percent were between 20 pyeong and 29 pyeong. Another 30.6 percent were between 30 pyeong and 39 pyeong, while 11.8 percent were between 40 pyeong and 49 pyeong. Finally, 8.8 percent were larger than 50 pyeong. According www.earoph.info, in 2005 average apartment size was 106.43 sqm and average household size 3.37 persons. However same source says that in 2005 were 12,494,827 dwelling units, South Korea population being 47,278,951 according Wikipedia, resulting 3.78 persons. Stated floor areas does include wall thickness and balconies, also common balcony at rear of unit in case of corridor-style apartments, but exclude staircase and lift lobby. I never found statistics about average home size of non-apartment housing. Many english websites state that Korean apartments are around 30 and 50 sqm, but they are referring at the officetel given for free for english teachers in Korea, NOT to real apartments for Korean families. Korean families are strong and children do not move out until marriage, thus small apartments are not needed. But my question is about what are doing the parents after children moved out, do they really need 100 sqm and 3 bedrooms? Many apartment complexes do not offer units less than 100 sqm. South Korea is one of the few countries in the world which had a residential building as tallest building: Mok-dong Hyperion (2003, 69 floors) and Samsung Tower Palace G (2004, 73 floors). Many skyscrapers were built in recent years, Lotte World Tower (554 meters, 123 floors) was completed in 2017. Traditional Korean houses are single-storey and have floor heating. 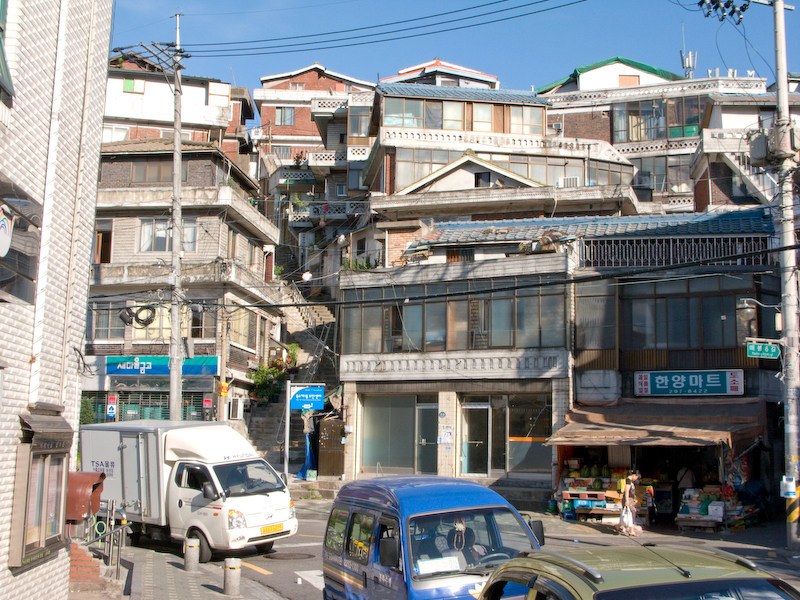 1945 multi-storey buildings were still a rare sight in Seoul. The Korean war (1950-1953) destroyed 20% of housing stock. Most people were living in crowded conditions without sewage and running water. The first apartment complex was built in 1958 but did not attracted much attention. 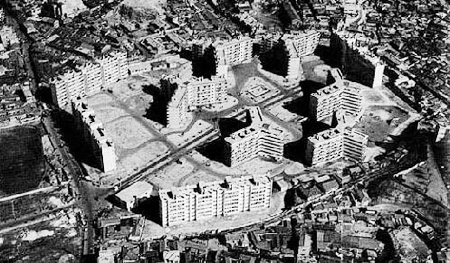 Mapo apartment complex built from 1961 to 1964 began the revolution. Consisted of 10 six-story buildings and housed 642 families. The flats were 9-15 pyeong (30 to 50 square meters). Very few Koreans were ready to live at height of the 5th and 6th floor. Apart from height, people did not like other features. The early apartment complexes lacked the traditional floor heating and were warmed by radiators. Mapo apartment was demolished in 1991. The real boom of apartment complex began in the early 1970s. In 1971 the Banpo apartments became the first complex with traditional heated floors rather than Western-style radiators, in the first complexes the the heated floors were only in bedrooms but later the entire living space became heated in this traditional way. This made apartments even more appealing to Koreans. Jamsil apartments built in 1970s was the first large-scale complex that included schools, parks and commercial centers, 19180 apartments spread on 1.5 sq km. Phases 1-4 composed by walk-up blocks being demolished in 2005 and redeveloped, Phase 5 with 15-storey blocks still standing. The 1980s and 1990s had a construction boom of unprecedented proportions. 80% of the housing stock of Korea was built since 1980. In 1990, only 22.9 percent of Korean families lived in apartments. By 2005 this share more than doubled, 52.5 percent of families were apartment dwellers. Preference for apartments is growing. In a 1992 poll, 41 percent of respondents said they would choose to live in apartments, in 2000, 77 percent gave the same answer. 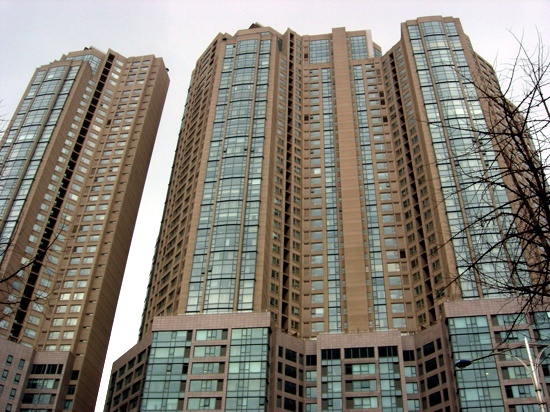 In 2005, the average Korean apartment was 32 pyeong, more than double the size of the largest flat in the Mapo complex. Korea have one of the biggest, if not the biggest apartments in the world! Note: above rows are sourced from Korea Times. Read original article. Jamsil photo from 2003-2004 when Phase 3 and 4 were demolished. Korean public housing history began in 1962. At this moment I do not have experience to distinguish public housing from private housing, all looks similar. Private developers are copy their designs each other, there are several types of “perfect” apartments, copy-pasted from one neighborhood to another. They pays attention to apartment efficiency rather to land usage efficiency or layout diversity or distinctive designs. Construction ratio was slower than urbanization ratio, making Korea to have one of the most expensive real estate prices in 1980s. In 1991 the government realized that cannot resolve the housing shortage without adequate supply of land, started the Two Million Houses Construction Project, built ratio overtook demand and this kept prices steadily until today. Aimed to 2012 to reach 320 housing units per 1000 people. Source: http://www.housingfinance.org/uploads/Publicationsmanager/8611010705.pdf, nice research about housing construction. As having a high-tech industry, the country is dominated by high-tech architecture with steel and glass buildings. Korean cities, together with Chinese cities, are the most monotonous cities in the world, every city have big apartment complexes with rows of identical buildings without any distinctive features. But this contribute to national equilibrium… and I still love it! All blocks are narrow and have long apartments, with many rooms as possible on frontal facade. All blocks have the frontal facade oriented to south (or southwest or southeast), with other words, are not arranged with facades front-to-front and back-to-back, but front-to-back. Unlike the western world apartments, Korean apartments have no distinction between day and night areas, the living room and kitchen-dining room are nearly always placed in the center of apartment, while the bedrooms (4 bedrooms in average) are placed in each corner to enhance privacy. Some 4-room segmented blocks have 30 by 10 meters, all four rooms (living room and three bedrooms) are oriented to south facade, on the north facade are located only kitchen, bathrooms, staircase, and lift lobby. Walls are probably load-bearing, I can guess this by lack of hacked walls in renovating apartments. Rooms are perfectly rectangular with no columns or beams protruding in rooms. Nice! Apartment sizes were traditionally quoted in pyeong (1 pyong = 3.3 square meters), including walls and balconies, and surprising, for corridor-style blocks it include the common corridor area. Sometimes both floor areas with and without balconies are displayed. Except some recent private developers, all apartment dimensions are divisible by 30 cm, most by 90 cm too, for example 2.7×3.6 m and 3.6×4.5 m bedrooms. This is weird… and is not imperial system, because 1 feet would be 30.48 cm. Standard floor to floor height is 2.70 meters, of which floor slab is 20 cm and many apartments come with false ceiling, thus the ceiling height is around 2.4 meters. Doors are tall almost reaching the ceiling, not like 2 meters doors in western countries. Government regulate private developers thus they build apartments in some standard sizes: 18 py / 59 sqm, 25 py / 84 sqm, 33 py / 109 sqm, 40 py / 133 sqm, 50 py / 165 sqm. Until 1998 were some rules for developers to provide 70% of apartments to be under 85 sqm and 30% under 60 sqm. This caused an oversupply of tiny 84 sqm 4-room apartments, so the rule was removed (source: http://www.prres.net/proceedings/proceedings1998/Papers/kyung.pdf but this rule is dubious, I see many small complexes built in 1990s having all units over 100 sqm). These compact apartments have 4 rooms (3 bedrooms, small as 6-7 sqm) and a single bathroom, all in 84 sqm of which balconies are about 20 sqm. In case of the the 3-room (and smaller) apartments, the living room have sliding doors to be converted in a 3rd bedroom. By studying block sizes in satellite photos and Google street view, a very vague estimation about apartment size distribution: 50% 3-bedroom, 30% 4-bedroom, 10% 5-bedroom, less than 10% 2-bedroom. All apartments have balconies, originally only for living room, but since 1980s or 1990s balconies are added at every bedroom, living room and kitchen, so about 20% of total apartment area is in balconies. They are minimum 1.5 m wide for living room and 1.2 m wide for bedroom so in case of small apartments, they add 33% to bedroom size. Early balconies had concrete parapet at bedrooms and with metal railing at living room, sometimes curved, thus enclosing balconies was difficult, balconies were continuous without supporting columns except at end. After 1990s or 2000s balconies have straight metal rail and supporting columns aligned with internal walls to facilitate closure of balconies and extension of rooms. Balconies are provided open, but in max 1 year over 99% get closed with sliding windows, in most cases the rooms are extended to balconies. Few open balconies can be still seen in the old blocks. A visitor of my website told me that the city authorities control the developments by gross floor area ratio, and the balconies are not counted as gross floor area, so nowadays the developers are building small rooms to fit in gross floor area limit, apartment floor area is indicated without balconies, while the balconies are provided as bonus space, developers offer to residents to extend rooms into balconies for an extra fee. However in 1990s and maybe in 2000s too apartment floor area was indicated with balconies included, thus I do not fully understand how this legal loophole started. 1970s apartments are composed only by 5-storey walk-up blocks, with distances between facades of 15-20 meters. 1980s apartments are composted mostly by 15-storey blocks, parallel blocks with minimal distance between facades of 40 meters (biggest in the world), but most blocks are placed further away to provide more space for ground parking, which became not enough during 2000s due to rising number of cars. Some staircase-style blocks are L-shaped with 3 or Y-shaped with 4 apartments per floor. 1990s apartments introduced blocks aligned in two directions, creating squarish courtyards. Corridor-style blocks are no longer common. 2000s apartments introduced underground and multi storey parking, this allowed greater heights like 20- and 30-storey blocks. Walk-up blocks still built in low numbers, now 3-storey only. Since 1990s every room in Korean apartments have a balcony like this. Pretty stupid, isn’t? especially when the sliding door to balcony leads to a very small balcony window. The reason for which the door is still here is that the floor heating was not installed in balcony. South Korea government choose to redevelop various areas of landed houses as well as old apartment complexes, into new apartments. Compared with Singapore where many people are looking to buy old flats purposely to be redeveloped via SERS programme, in South Korea many people protest against redevelopment (as told by a visitor of this page). Residents receive a compensation based on market prices and they need to buy themselves a new apartment, which is often unaffordable, new apartments being bigger and more luxurious cost a lot more than the value of old properties. Korean housing is composed by public housing, simple-looking blocks with ground parking (above photos); then some complexes similar with public housing in block shape but featuring underground car parks and wall motifs (did not know if they are semi-public or full private housing); then the luxury apartment complexes (below photos), easy to distinguish due to non-standard block shapes and, in most cases, helipad on the roof. The rest of city is composed by private low-rise individual apartment buildings mixed with single family homes, I do not know the sizes of these, but according numerous Youtube videos made by english teachers in Korea, there are numerous 1-room apartments. Korean automotive industry had the most spectacular growth of the world. The first Korean-built automobile was Hyundai Pony, launched in 1975, and in 2009 South Korea became the 5th automotive manufacturer in the world, and the first country in terms of automotive production compared with its population, overtaking Japan, thanks to increased demand in China (source: Wikipedia’s List of countries by automobile production). The explosion of cars causes a lot of parking problems, visible in this funny photo (the snow proof that even the driveway was filled with parked cars). We need multi storey car parks to be added in old apartment complexes, like in Singapore. Gaepo Cha Jigu Apartment, built 1982 (according its page, probably a mistake, it looks like 1970s) is one of the complexes with smallest apartments, ranging 35 – 71 sqm, floor plan. Banpo Apartment built early 1970s, contains a rare 2-storey units, also know as maisonette or duplex in british english (blocks 94 and 95), see floor plan. Apgujeong Hyundai Apartment, one of the most luxurious apartment complexes built in 1976-1979, with apartments ranging from 108.9 to 213.5 sqm, plus one block with 56 units of 264.9 sqm 7-bedroom, see floor plan. Unknown-named estate next to Jamsil, built 1979 with units ranging 92 – 212 sqm, including a rare corridor-style apartments with 5 bedrooms 150 sqm (corridor-style is usually for small apartments, max 3 bedrooms), floor plans. Jamsil Ricenz, built 2008, having one of the smallest apartments: 42 sqm 2-room, largest being 158 sqm, floor plans. Some apartment on Busan waterfront, units up to 292 sqm with a weird floor plan having a bedroom much bigger than master bedroom, floor plan. LG Metro City, largest apartment complex in Busan, 80 buildings with 7374 units ranging 80 – 306 sqm, floor plan. What’s up with so many rooms? Korean apartments have 3-4-5 bedrooms unlike other countries where 3-bedroom is dominant. What’s up with the HUGE balconies? New apartment blocks have balconies big as 20% of total apartment area. Some bedrooms have two balconies, in both sides. Some bedrooms are 2.7 x 3.6 m with additional 2.7 x 1.8 m balcony (50% more!). Apartment owners quickly enclose balconies and join with the room… so why the blocks aren’t provided from start with less balconies and bigger rooms? What does support these blocks? I see both in photos and floor plans perfect rectangular rooms with NO protruding pillars and NO beams at the ceiling. This is similar with communist blocks with load-bearing walls but Korean block walls are too thin and I do not think that the weight 30-storey blocks can be supported by load-bearing walls. Oh wait… no earthquakes over 4-5 Richter in Korea. Page published for first time in 2009 and updated with more information over next years. Most research been done in 2012-2013 when Google Streetview has been launched in Seoul and Busan, after 2013 I no longer had time to study South Korea. A new era of research began in 2018 when I discovered map.naver.com. Do you have useful information that worth adding? Did you found an error or have a contradictory opinion? Leave a comment! I’m 56 old Korean came from Jamsil Seoul and have been staying in Holland Close last 3 years so far. I’m not an expert of housing business but to share my thoughts as an ordinary Seoulite. 	As for the typical Korean family, mostly it has Husband & wife, two children (boy and girl) and the husband is supposed to be having a study room to read book/newspaper or for his won purpose. 	This additional study room easily to be provided for the relative guests who are visiting this family frequently from home town such as mother in law. So, they prefer two room for children, one master bed room for couple, one study room for patriarch which is the husband, head of family, and plus living room and kitchen. What’s up with the HUGE balconies? New apartment blocks have balconies big as 20% of total apartment area. 	At the first, more than roughly 60% of Seoul family were originated from rural province area – so called country boys and girls who were relocated from outside of Seoul or Busan metropolitan cities. 	Still they miss the country life style – such like feed plant, vegetables, flowers, making soybean paste by themselves. The balcony area enables them to enjoy those country style activities even within apartment. Good to dry laundry in the balcony as well. 	So the housing developer offer the balcony area as so called – Service Area which doesn’t included in net room area in order to attract the buyers. As you know well, the balcony area is built outside of building columns. It is attachment of building. 	For reference, the mixed Commercial & Residential Apartment doesn’t have balcony. 	There is no worries on earth quake so far because of high tech of construction engineering but getting reinforce the building regulation. – Look at the MBS building by Ssang Ryong. 	Relevantly, Korea apartment’s ceiling height is very lower than Singapore Condominium. 	In general, it is 2.3 – 2.4 meters high. I guess, because all of Korea apartment and landed houses as well, have equipped warm floor heating systems – water boiler piping beneath the floor, which occupies ceiling height. 	This low ceiling height openly causes noisy transmitting to neighbour hood including upper house and bottom house issue that comes a social problem now a days. We expect new apartment design with higher ceiling room. When I read your article about housing in South Korea, I was very surprised at your judge that apartments in Korea were one of the biggest in the world. I have no doubt about that, but I wonder if it still true for Seoul? When using google maps+ street view to look around this city, I found an icredible contradiction between the population density and the way of how houses and apartments were built. Seoul is one of the densiest cities in the developed countries, while their houses and apartments are relatively low and sparse, when compared to other cities. So if the apartment size for each family in Seoul is as large as you indicated, how could it provide enough living space for such dense population of Seoul? If necessary, I would give you some information that I have collected to clarify my query. Average apartment size in Seoul is higher than countrywide average (this is already indicated in article). As far I read years ago on other sites, government regulate maximum price for each apartment size and this makes more profitable for developers to build larger apartments, I also read about a law that developers are required to provide certain percentage of apartments under certain size, but my own study on the map contradict this. What information did you collected? Sorry for delay but only today I had some free time to read whole file. Did you wrote this? It is full of spelling mistakes, I don’t have time to verify the facts you present here but they may have mistakes too… do I earn anything if I spend time helping you? Singapore population density is over 7000 people / square km, but the dense HDB blocks that house 80% of population use just 10% of land area, they have also many landed housing areas, golf courses, a huge port, 5 airports, large forested areas, reservoirs, etc. Seoul don’t have these so the built-up city fill up almost whole administrative land. Sorry for replying you too late. I know that asking my questions could take your valuable time, but I don’t think that it’s useless for your business. Having a house with a yard seems to be an illusory dream with most city dwellers in the world. Seoul is definitely an exception: the housing density in this city seems to be lower than most metropolitan cities in the world, which means the percentage of open space is high, while the population density is one of the highest in the world. Having such a high contrast but Seoul is not notorious for both too small or too expensive houses like other large cities in Asia (like Hongkong, Tokyo,…), do the Koreans have any secret behind that? Whatever their secret is, I still suppose that it’s a useful lesson for other cities. I have used your recommended website to study more clearly about the apartments in Seoul, especially in Dobong District (I have explained the reason why I choose to study this district in my file). As I calculated, the apartment blocks contains-on average-only around 15% of each whole apartment town’s area. This percentage is extremely low when I compared to the apartment towns in Hongkong or Singapore. The blocks height varies between 9-18 stories, most are with 13-14 stories, too low! So the only factors that could make the population density higher, as I guest, is that the percentage of occupied apartments in Seoul is extremely high, probably the highest in the world! However, I don’t have any statistics to approve or reject my conjecture. Could you please show me a little bit information about this?